Shown above are some of the quality component manufacturers we represent. Product and company names mentioned herein may be the trademarks of their respective owners and they are acknowledged as such by Trend-Tronics Incorporated. The information provided herein is believed to be reliable; however, Trend-Tronics, Incorporated assumes no responsibility for the use for inaccuracies or omissions, and all use of such information shall be entirely at the user's own risk. 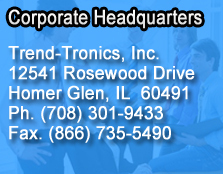 From our headquarters in Homer Glen, Illinois, we service the Illinois/Wisconsin territory. We provide both inside and outside sales, telemarketing, warehousing and market research for our principals. 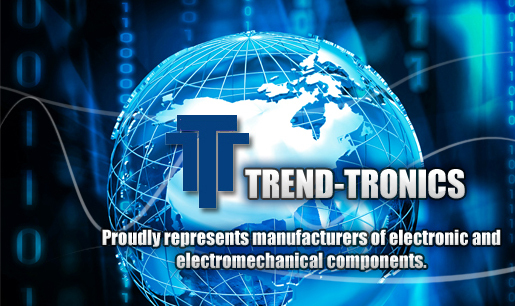 Founded in 1975, Trend-Tronics proudly represents manufacturers of electronic and electromechanical components. For more information about our services, please don't hesitate to call us. Thank You for your interest in our company. Copyright © 2011 Trend-Tronics. All Rights Reserved. Redesigned by: Afable ACS, LLC.